Just over one year ago I started my MBA journey, and cannot believe that I am almost halfway through the taught content already. The first year was a fantastic learning experience, and I’m hoping this year will be even better given that I have chosen all but one of the modules (and I would have probably selected the compulsory module anyway given the choice) – see here for a list of the modules I am studying. I always like starting a new year as I feel it gives me a ‘clean slate’ – I can change my approach and objectives without being held back by how I did things the previous year. So, what will I do differently in 2013? I have written previously about the importance of time management whilst studying for an MBA, and this was definitely a big challenge last year. In 2013 I have decided to approach this differently; instead of allocating myself a specific number of hours for study every day (eg. 3 hours on Monday evening, 5 hours on Saturday, etc), and then distributing this time based on an average of 8 hours per lesson, I am going to try studying based on a schedule of lessons/activities to be completed each week. To prepare for this, I have mapped out all the lessons, TMAs and assignments that I need to complete for each module, and then allocated them to a specific week over the duration of the semester. Then, I will approach studying on a week-by-week basis, rather than the day-by-day basis of last year; if I have a free evening then I will study more that day, and have more time free at the weekend; whereas if I am busy on a number of evenings I will expect to spend more of the weekend studying. So far this has worked well – I achieved my goal of completing lesson 1 of both Management Accounting and Management of Change by Saturday afternoon, giving me all Sunday off (although I acknowledge this is not really an appropriate sample size!). I’ll provide an update on how this is going later in the semester. Management Accounting – Produce a mind-map that includes the key topics, but not lots of detail about the content. I intend to use these notes to help me develop the structure of my final assignment, but then refer to the textbook as required if I need to review specific topics when developing the content. 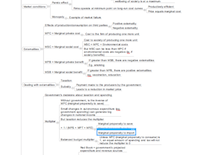 Management of Change – Write sequential notes that highlight any interesting points that I might want to bring into my assignment, and then create two separate tables for examples/case studies, and theories. When writing the final assignment I will review the notes prior to developing the structure of my final assignment, and then refer to the tables to bring in specific examples/theories into the content. As such, moving into 2013 I want to change how I am studying the MBA overall, and specifically the modules I have chosen. Instead of my aim being to understand the content delivered, I want to take a slightly wider approach: exposing myself more to the topics outside the teachings from WBS, taking time to formulate my own views in the areas I am studying, and at the end of each lesson asking the question, “Have I learned enough to engage in discussions on these topics in my career, and offer my own qualified opinion or perspective?”. I doubt I’ll be able to do this for every individual lesson, but hope to take this extra step for those lessons that are immediately relevant to my career, or those which are of particular interest. Obviously this will require more time, but hopefully the previously mentioned changes to time management and note-taking will help with this. That’s it for this blog post – good luck to all new and current students starting a new set of modules; if you’ve not already seen it, here’s a post from 6 months ago that might be useful as you plan this semester, Ten tips for the Warwick DL MBA. One important, but often neglected aspect of preparing to study for an MBA, is deciding how to take notes. Initially I started to write notes summarising all the key points from the textbooks and online lectures, often duplicating complete lists and paragraphs from the text. However, I quickly realised that this was producing copious amounts of notes that I probably wouldn’t refer to in the future, and when I did need to use them I wouldn’t be able to access them in an efficient manner. So I decided to spend some time looking into how to effectively write notes, starting with the question ‘Why am I taking notes?‘. Exam revision – I expect this is one of the most common reasons for taking notes, which requires notes to be succinct, providing reminders to key concepts, and definitions of key terms. Essay support – I’ve never written notes to support the writing of an essay, but I think the main addition over exam revision notes will be quotes or useful explanations of topics, along with their location in the textbooks/lectures so they can be easily referenced. Work-related future reference – For this use case it might be appropriate to take more notes, which include not only key concepts, but explanations, supporting lists and detail. I would personally question the value of this approach when studying for an MBA, as trying to write a reference at the same time as studying is likely to take a significant amount of time that might not contribute to the learning process. Plus, in my experience, textbooks written by professional authors are of more use than my own notes when referring to them in the future. For the first semester on the Warwick Distance Learning MBA, two of the modules are assessed via an essay and one is assessed via an open-book exam, so the notes for each of these will need to differ slightly in format. I found the exam revision notes straightforward as I have produced these for various exams over the past few years. However, the essay notes have proved more difficult to produce, as I have not written an essay in over ten years. Although I think I am using an effective format, I hope to validate this when completing my Tutor Marked Assignments (TMAs) – these are essays that are marked by tutors, but do not count towards the final grade. When writing these I will need to refer to my notes, so hopefully they will identify how effective these are before I get too far into the course, and also highlight gaps in the notes that can be filled for future lessons. 1. Highlighting and writing comments on the text itself – this is probably the most convenient of note-taking methods; however, it has the disadvantage that every time you need to refer to your notes, it is necessary to review a full lesson / chapter in order to find the relevant comments. These types of notes are also more difficult (although not impossible) to search. 2. Writing text / lists that summarise the key points, along with any particularly pertinent information about those points – this has been the traditional way that I have made notes in the past, and is very easy to search. The disadvantage of this approach is the time it takes to write the notes, and reviewing these can be difficult unless a lot of time is invested in structuring the notes into a readable format. 3. Mindmaps that summarise the key points, along with any particularly pertinent information about those points – mindmaps are a concept that I have used in the past, but not for note-taking purposes. Although they share the disadvantage of the time it takes to write the notes, they are often easier to refer to in the future, and provide a more flexible environment in which to take notes. My original intention was to use a combination of approaches 1 and 2 for note-taking. However, I found that highlighting did not give me the control I wanted to structure the notes, as I was forced to record them in the order they were presented in the text, and the second approach was taking a significant amount of time even before I started to apply a structure to the notes. I then tried using mindmaps, and so far am very pleased with this approach. I plan to continue using them until the first TMA, at which point I can decide how helpful they were, and whether to use the same or an alternative method in the future. Although this is my current view on writing notes, I am sure that at the end of the first semester I will have a different perspective, especially after completing the open-book exam, so I will probably post back then with an updated opinion. 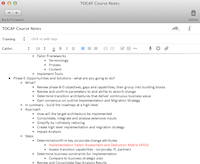 In the meantime, it would be great to get your thoughts on writing notes – what works, what doesn’t, and any other tips to help fellow MBA students.